Actress and singer Barbra Streisand appeared at the White House on Tuesday, and was presented with the Presidential Medal of Freedom alongside 16 fellow recipients. Streisand was asked by reporters at the event to give her thoughts on the 2016 presidential race, where she said that a face-off between Donald Trump and Hillary Clinton would be an assured television spectacular. Streisand has been a long-time supporter of the Democratic Party, and offered statements in praise of Obama and Clinton, who she’s pulling for for 2016. “We need a woman president, we need compassion [and] we need to have a person who comes from the heart, and experience,” Streisand said. Indeed, despite the controversy Trump repeatedly drums up, reports suggest that his presence is at least part of the reason for why televised news events and debates have set viewership records. 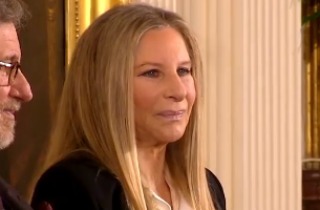 You can watch Streisand’s ceremony and interview in the video above, via ABC.